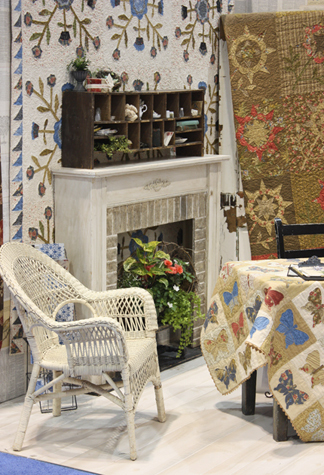 Here's a peek at our booth from Spring Quilt Market. 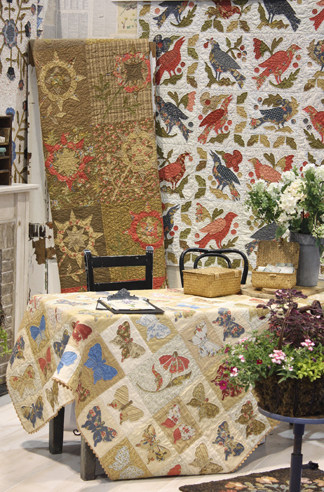 Each quilt in our booth will be in our new quilt book, In the Meadow. Our book will be available in a couple of weeks. The fabric used in the quilts is from our Meadow line which is at quilt shops now. Actually we were surprised how well the fusible product worked. You really can't tell they aren't appliqued by hand unless you get really close. Barb added several flower blocks to the top just to mix things up a bit. In the background of the photo above you can see Barb's newest bird quilt. This quilt is made from 6 bird blocks which are repeated and reversed to make up this flock. These large shapes are easy to applique. "Cosmos in the Meadow" is the quilt hanging over the door in the back of the booth. The low contrast of the prints chosen almost makes the pattern hard to discern in some of the blocks. Many times when you have a pattern that repeats you only have to look at one or two blocks to recognize the entire design. For example, the pattern of the quilt over the fireplace is easily identified. "Cosmos in the Meadow" makes the eye look over the entire quilt longer to see the pattern. On the floor is a peak of our new hooked rug pattern....it's also in the book. Deb Roberts, the owner of The Quilted Moose in Gretna, Nebraska brought "Midnight Silhouette" to show. Her shop took the pattern and made the quilt at 50%. It's so sweet! Lovely quilts and look forward to the book! Looking forward to the book. I loved the video and those are beautiful quilts!! I am head over heels in love with both the butterfly and the bird quilts. I NEED them! lol! Beautiful! Hey, I'm still not in the 21st century as far as applique goes. I need a machine that can do zig zag -- that would be a start. lol! I can't wait for the book to come out! I love all of the quilts, but really love the Cosmo's in the Meadow Quilt. It's going on my To Do List right away. I enjoyed the video and getting to see your booth at market! I go to the Quilted Moose in Gretna, NE. I will have to stop by and tell them I saw their name on your blog. 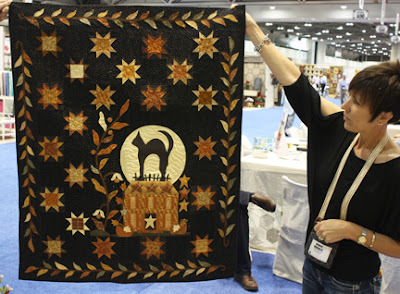 What a great idea to have the video of your new quilts and fabrics. I cannot wait to see the book. I think every quilt is wonderful! I can't wait to get stitching, it only I could finish the Christmas Garden cross stitch project!!! Im so glad to hear that you are using fusible and your sewing machine for applique! I always feel like I am cheating because I do my applique the same way. I dont have time for hand work, now I feel vindicated since the designers are doing it too! Laura B.
Alma/Barb -- you two have really outdone yourselves this time ! Oh my, when my friend Debbie (Wick) and I saw your bird quilt we knew we were in trouble. Thanks for continuing to inspire us! Love the big birds! Everything looks great! Can you give us a hint how much fabric is needed for the background of the Cosmos quilt? I really need to buy some fabric and can't wait for the book to get started! Love the new bird's quilt and the butterflies too. Hope we can buy the new book in the Netherlands soon? Have lots of your books and always looking forward to new ones. Love you both, and have missed you in blogland!! Love the quilts and yes, chuckled to hear your faux pau of date and Barb's face. Please, do tell more of the mystery, I couldn't quite hear it all and even played it back. I've got several more of your designs on my to do list, so glad I can follow suit and do fusible! Each line is more and more beautiful!! Oh my! The Bird quilt...the butterflies...I've got my work cut out for me. Actually, I guess I'll have a lot of cutting to do myself! So happy that there is a great quilt shop not far from us here in TN (finally moved)...Tennessee Quilts in Jonesborough...they have some of your fabric and books. I'll request this one!!!!! The butterfly quilt is on my to do list. How much fabric do you need to make this and how big is the finished project? Alma, my best to you & Barb on your new quilt book, In the Meadow. I can't wait to buy it! It's been about 6 years since I made my little spiral journal in the class you taught in Liberty. I had so much fun getting to visit with you & will forever appreciate your encouragement & guidance on how to incorporate my antique photo collection in my crafts. You're amazing my dear friend! Another wonderfull book, another success. 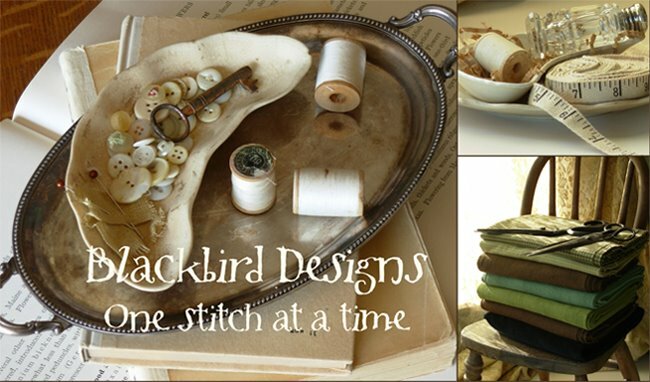 The bird quilt is amazing, and I can't wait to make it! But I can't find your book. Is it available yet? And where? Thanks!! The pattern of the quilt over the fireplace is easily identified.